We are on our way to Kota where the main orphanage and Hopegivers/Emmanuel headquarters is located. Yes, it's true; I finally coaxed Maria onto the back of a big cud-chewing, saliva-spitting camel. 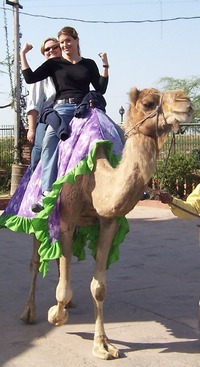 She was very apprehensive at first, claiming that she always gets spit on by camels. When challenged with when she's ever been on (or near, for that matter) a camel, she admitted that maybe it was only one llama that spit, but he looked a lot like a camel! So we started out today being picked up by Sam at our hotel at 7:00 a.m. It was supposed to be six but we are officially on "Indian time" now. 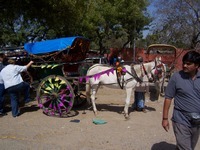 Heading out of the Delhi, me joking that I'd like to pet a cobra before leaving India, we drove toward Agra. It was a lovely drive through big green fields with traditional straw huts scattered in the morning mist. Sam says that property in India is so expensive because all of the land in between cities is owned by government used for agriculture, thus land for sale is scarce. After driving for a couple hours, we stopped to torture Maria with the camel riding. Luckily she is a good sport and we finally got her on after bribing her with a hundred doll hairs (she thought I said "dollars," go figure). After the camel adventure the guy, eager to make a few more bucks, pulled out his little straw basket housing an adorable little cobra (I love oxy-morons). This small, highly venomous cobra danced and waved to the mesmerizing flute music, just like the movies, puffing out his neck. At first the cobra was striking at the man, but after awhile, he wore it down and it was as docile as a night crawler, allowing the man to hold him. 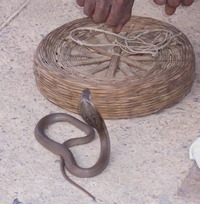 In fact, while holding the cobra on his arm, he asked if I'd like to pet it! God has such a great sense of humor, does He not? Of course I said "Yes! "…and so I did. And I even lived to tell about it—much to my hubby's disappointment. He likes it when I live on the edge on these trips because he always takes out extra life-insurance beforehand. So then we had an amazing lunch! Sam ordered for us and then force fed us half the food in the restaurant. He is stubborn and won't take "no" for an answer when we tell him we are full to the gills. He ordered me this great drink today called a fresh lime soda. It is made with lime, club soda, sweetener and a pinch of salt. It's the best! I wish I could tell you what we ate, but how can I describe authentic Indian cuisine? It was fantastic though! Next, we got off course. I'm not sure how it happened, since I wasn't driving, but Sam was so into our stories about the lost world of Wyoming, that he forgot to turn off and we drove an extra 30 Kilometers (20 miles) past our turn. 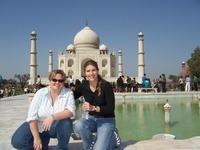 This afternoon, we got to visit the Taj Mahal! We took a horse and carriage ride and it was really fun. I didn't know much about the Taj but it was built in the 1600s by a Muslim dude for his second wife. Here is a great link with a brief history. It took 22 years to build and is considered one of the seven wonders of the world. After today, I agree! 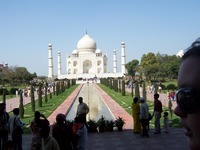 First of all, the courtyard and extravagant buildings around it are all symmetrical, as is the Taj. I can't adequately describe the intricacy and magnificence of this place but I'll try. 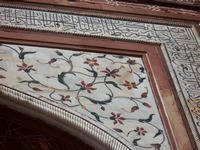 It is built out of marble and has literally hundreds of thousands of gems and precious stones inset into the marble to form flower designs. Stones such as jasper, agate, jade, turquoise, coral, carnelian, etc… The flower designs are everywhere throughout and it is beautifully carved with different kinds of marble as well. It is built overlooking a river and has several optical illusions purposely created into it. For one thing, there are geometrical designs also inset into the building but they are constructed smaller at the bottom to larger at the top so that they appear the same size (instead of getting smaller toward the top). Another cool thing is that one of the stones inlaid into the designs all over the building glows in the moonlight and so night visitors have to pay $100 per entry ticket! We had a really cool guide, Brijesh Gupta, and he let us take pictures in areas we weren't supposed to.